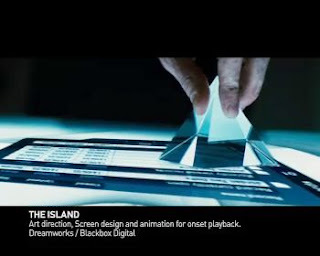 Mark Coleran designs fictional interfaces for movies and has a reel on his site (via N-Gen). Last year's Alertbox column by Nielsen listing 10 problems with showing such interfaces that concludes with, "Research funding and management expectations are subtly biased by the incessant emphasis on unrealistic UI design such as voice, 3D, avatars, and AI. When you see something work as part of a coherent and exciting story, you start wanting it. You even start believing in it. After all, we've seen 3D and voice so often that we've developed an implicit belief in their usefulness." A very entertaining and illustrated academic paper on the subject.